As a continuation from my last Blog Post on Children’s Toys – How to Organize! I want to continue with children and organizing their Artwork. This is an area many parents struggle with … especially if they have a large family. It truly is impossible to store every art piece from every child for the 18 years of their educational/school life. You’d have to have a museum. The first time your child scribbles or attempts to color or draw, you find it to be a precious piece. So you keep it. But then they create the next few pieces and you begin to see progress. So you feel like you want to keep a timeline of their developments. Well think about this. If you decided to keep 5 pieces of paper a week and multiple that by 4 weeks, you would have 20 pieces of paper. Now multiple those 20 pieces by 12 and you have 240 pieces in one year. Take those 240 pieces and multiple it by 12 years. You would be holding 2,880 pieces of paper. Now that’s a big deal. But what if you have 2, 3, or 4 children, you would be dealing with 5,760, 8,640 or 11,520 pieces of paper respectfully. Yikes where would you store all that? You truly would need another room in your home just for storage. The funny thing is that’s just pieces of paper. We are not talking about physical projects or art creations. Reality is you cannot keep all of your children’s Art pieces or projects. But the bigger reality is how do you deal with that and get your children to understand that reality without you the parent feeling guilty or you are being a “bad” parent? Understand this, your child lives in the moment. So for the moment, that piece is precious and important. But I would venture to guess in a few weeks, the excitement of that piece will have worn off and another is there to replace it. Bottom line you don’t need to keep it all. Here are some thoughts and/or tips to help you navigate this issue and have peace in your family … oh and also not a lot of clutter. Upfront set the rules or agreement around Artwork. You could give each child a set of these boxes by Rubbermaid. They would have to store all their Artwork and/or Projects in these containers. Once the containers get full, they need to make decisions about what they will let go before any more is added. Of course, as they are tossing some pieces, you can take a picture of it and have the memory via a photo. You could say that one piece per child gets to be displayed on the refrigerator for one week. At the end of the week it goes … even if there is not another one to replace it yet. This way they will have a clear understanding of the system. If the project is truly special, you can take a picture and again, keep the memory via a photo. Or they can store it in their own box. Early on, explain to your children that space is limited and they cannot keep everything. Help them to make the decision to keep only that which is meaningful. What would that look like? First and last math paper of each school year. Highest graded paper for each year. Be sure to label the paper with the child’s name, date, grade, and teacher. If there are large posters, you could have your child hold the poster and take a picture. Agree to display it in your home for a week or two. After that it must get recycled. When you child is old enough, have them write letters to grandparents or relatives on the back of the Artwork and send it off. Be sure the project or creation is functional. When a child makes a piece with clay or play dough and you don’t want to display it, let them play with it. Once it breaks, then it has to be thrown away. Let’s say your child makes little cars with his clay. Well let him physically play with the cars until he tires of it or they break. Then they need to be tossed. During a school year, create a folder for each child to store important papers in. Only keep the ones they may need to take a test down the road. Once the test is done, toss the papers. You can keep the test … if it’s important to the child. You could give each child a large 12 x 15 envelope for each year of school. They store only what can fit in each envelope. The rest must get recycled. On the outside of the envelope, be sure to have the child’s name, grade, teacher’s name and school. You could also paste a small school photo of your child on the outside. Then place each envelope in a plastic bin or archival box. At the end of the school year, have your child go through the envelope to see if there is anything that can be recycled. Have a bulletin board or a magnet board in the kitchen or other room that you display their Artwork. Take a clothesline or ribbon and use small craft clothespins to attach the Artwork to the line. Create your own mini gallery. It could be the hall way or even their bedrooms. Take a dowel rod and attach stripes of felt to it. You could pin Artwork to the felt. Hang one in each of their bedrooms. If possible and you have the space, create a “kid friendly” craft room or area. Let it be a place where you can keep all their supplies … and even have a space to display. You could have a shelf in this room and each child gets their turn displaying their creation. Be sure to purchase furniture that can potentially get ruined from spills or crayon marks and you won’t be upset about it. This would then take the worry out of your children crafting and being creative. 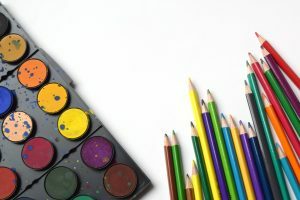 Hope these Tips give you some “creative” ideas for your children’s Artwork and papers. If trying to create a system is still overwhelming to you, let me know. I’d be happy to assist you with this fun detail for your family. Your Health, Wellness and Organizing Expert … Believing in You!